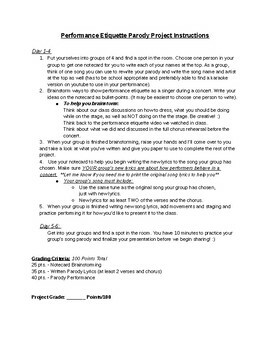 These are instructions I made for a performance etiquette parody project I've done with my 6th-8th grade chorus students, but can also be used for upper elementary or high school. This took about a week for my students to complete (started on Monday and performed on Friday and the following Monday). Great for squeezing in an extra major grade right after a concert, especially at the end of the year. This product downloads as a Microsoft Word document for you to edit if you'd like.